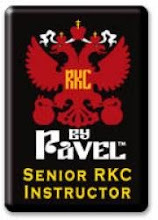 The participants at the Danish RKC were put through their paces with the program minimum. This consists of swings and get ups. Now if you are using this in your training you can split the two and work swings three days a week and get up on the other two days. This covers all the bases. At the RKC we did things a little different, of course. I ran the workout and it was very simple. Partnered up, one person does swings and the other does get ups. The person doing the get ups does one on each side while the other person does swings, then switch. The swings are timed by the person doing get ups. The set lasts for ten minutes. Women should use a 12kg and men should us at least a 24kg. If it's easy it's not heavy enough. I have another workout that will be rearing it's ugly head at the LA cert. Remember that simple is the way to go. Don't change things just to change things. PS Training today 24kg Get ups 10 minutes straight. Shut up! are those PANTS you are wearing? LOL!!! Yes, I they are part of the dress code for instructors. Jen always tells me how strange I look in pants. Nice workout. I have awesome video of your prog-min workout. figured it had to be the dress code. Had to give you a hard time!